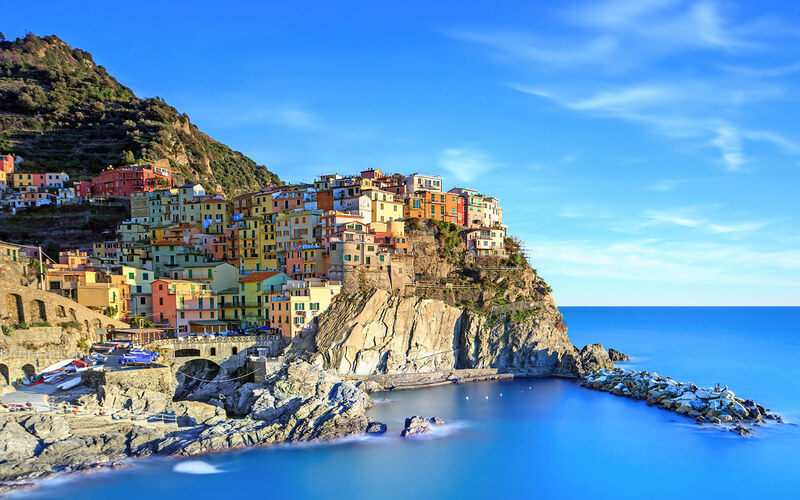 Within the Cinque Terre National Park in the rugged coast we can admire the five most famous resorts of the Ligurian Riviera: Monterosso al mare, accessible by Levanto for the road to the road, is surely the most popular and the one with the largest beaches. From here the UNESCO protected National Park is a heritage of humanity. The five villages, Monterosso, Vernazza, Corniglia, Manarola and Riomaggiore can be reached either by train or by boat, or by the so-called green-blue trail (at the moment the famous 'via dell'amore' between Manarola and Riomaggiore is closed for reasons of Security) or the 'high' trails linking the five sanctuaries above the inhabited centers, fascinating trails that wind through olive groves and vineyards overlooking the sea. In succession we find the villages of Vernazza, an ancient medieval village, Corniglia that rises on top of a promontory with its more agricultural aspect than sailor, Manarola on a rocky pedestal overhanging the sea and finally Riomaggiore located at the mouth of an Apennine stream. During the journey you can buy great local products such as wine, oil and honey.